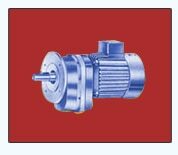 Industrial Gear Motor :- SHREE SHAKTI Gear Motor are designed to provide, a most efficient, economical and compact drive for low speed Applications. It is a most compact drive for low speed Applications. It is a most compact combination of an electric motor (A.C. or D.C.) and a gear box (helical, worm or epicyclic) converting the high speed of the prime mover to low speed with maximum efficiency. These units are manufactured under the supervision of trained, personel, with strict quality control, and with latest technical know how.